I'm guilty every now and then of getting a little off track. But while it makes sense to me, it maybe a bit odd to the average Joe-shmo reader who just wanders in and takes a look around. But let me preface this post by saying that I've been meaning to post this for a long time. What is true leadership? Is it Henne? Hart? Long? Carr? Or is it maybe something a little deeper? The term "Michigan Man" is thrown around quite a bit. And while I admit it seems a little cliche, I do try to subscribe to its true meaning. Its sort of like trying to explain "the force" to someone who's never seen Star Wars. Being a Michigan Man does not give you special power of course. But What it does is instill inside you a certain set of values. 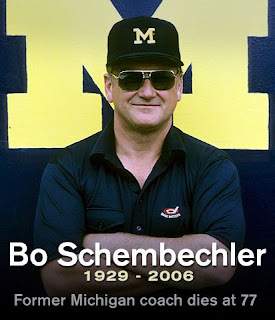 Bo Schembechler was the personification of a Michigan Man. He coined the term and lived it every day. He made the people and players around him better. 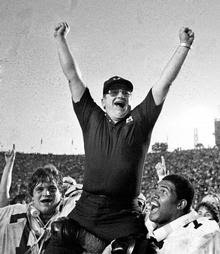 Bo had a reputation for being loud, and his overreactions on the sideline were historic. But often, when the cameras were turned off, or he was one on one with his team or players, he was a different. He was an incredibly affectionate person. He was very sensitive. If a player had a problem, his door was open. 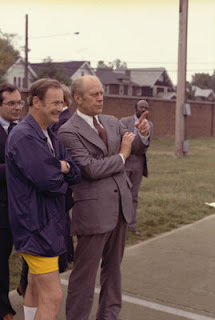 But if a player needed a kick in the pants, Bo was happy to volunteer his foot. But he never did it for kicks (pardon the pun), he did it because he knew there was a fine line between motivation, and going too far. Its the fine line that all great coaches know well. 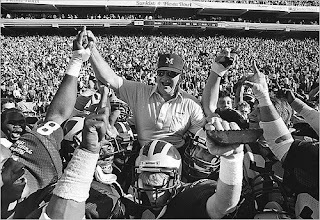 Great coaches were tough as nails. But after practice, were there for you. There's a tactic that the military uses to train new recruits. They tear you down...both mentally and physically. And when you can't see straight anymore, when you are at your breaking point, they build you back up. They turn you into the kind of soldier you never thought you'd be, but they always saw in you. That was Bo's style. He was like a general during the summer two-a-days. 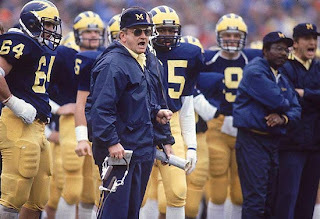 He killed his 1969 squad, his first in Ann Arbor. They hated him. A lot of players quit the team or transferred. But when the summer was done, and the season started...it paid off. 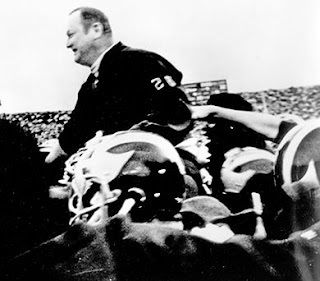 That 1969 team was as tough a Michigan team there has ever been. They beat the #1 buckeyes in Bo's biggest win ever. They earned a trip to the Rose Bowl. And like the sign Bo hung in the locker room on day one: Those Who Stay Will Be Champions. 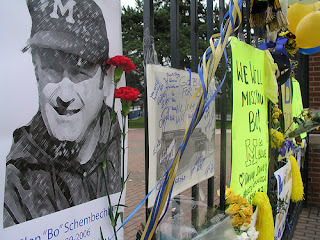 When Bo died on November 17, 2006, I felt great loss. The kind of loss you feel when you realize that someone you thought was larger than life, and would always be around, isn't anymore. The timing was simply eerie. On the eve of the largest Michigan/Ohio State matchup ever. #1 vs. #2. There didn't need to be a bigger storyline, the game was enough. 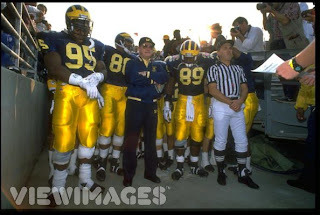 But as the players left Schembechler Hall and boarded the buses to go to Columbus, you could see the loss in their eyes. There was nothing there. 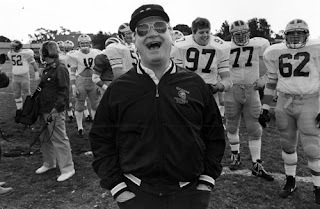 Just a hollow void left by the old coach who'd been like a father to so many players, and somehow like a grandfather to the Michigan players today. They fought as hard as they could to win one for the old coach, but it simply wasn't to be. And I don't have a problem with that. You don't win every big game. 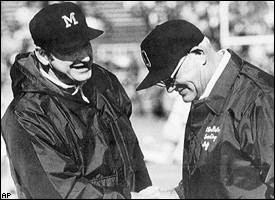 Of course I would've loved to beat Ohio State, but what thought I couldn't shake that day, was that Bo was gone. All the former players and coaches who lost a best friend. All the fans who lost a mentor. I have no doubt Lloyd probably doesn't remember that game very much. Sure when the game is going on, you're mentally there...but the emotions were elsewhere. Bo was elsewhere. But as that November day played out and the last whistle blew...Ohio State had beaten the wolverines 42-39. And Woody looked at Bo, Bo looked at Woody, a small smirk on both of their faces. They stood up, they shook hands and hugged. It was the way things were supposed to be.